I love everything about it – the lack of routine, that feeling that you’re always just on the brink. It’s like you’re working at 100mph all the time. It can be hugely challenging, but it’s also incredibly exciting and fulfilling. I loved my time at LSBU – studying there was one of the best decisions I ever made. But when I left I didn’t really know what I wanted to do. I ended up in an admin role with a local authority. It was a good job but I found the routine pretty stifling. I had this idea at the back of my mind that I should be in education, so I contacted my old school and asked if I could come in for a couple of days and see what it was like. That was it. I did my PGCE at the Institute of Education and started work as a teacher in 2007. 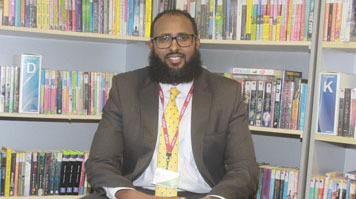 I got the job as ICT teacher at Forest Gate Community School in 2008. Now I’m deputy headteacher, with a whole range of responsibilities including taking the lead on pastoral issues and safeguarding. You never stop learning. This school is really open to change, and to new ideas. That’s very important to me. About five years ago, the headteacher asked me if I wanted to join a two-year fellowship programme run by the charity Teaching Leaders. I jumped at the chance. That gave me the opportunity to make a lot of practical changes, like introducing smaller tutor groups, setting up a peer mentoring scheme, running exam skills sessions and providing space for pupils to come in and revise, all aimed at building confidence and increasing attainment. We were coasting; now we’re one of the highest performing schools in the country. Our exam results improved by 18% in one year, and our Ofsted rating has gone from ‘Requires improvement’ to ‘Outstanding’. We piloted the new ways of working in maths and English, but now they’re rolled out across all subjects. It’s part of the culture now. At the end of the programme, I won an impact award. It was great to have that recognition of the changes we’d been able to bring about at the school. Improving pupils’ mental well-being is a major priority for me at the moment. Children these days are under a lot of pressure. They want to do well, but life is complicated. There are a lot of family and personal issues to deal with too, and it all has an effect. We have a full-time Family Support Worker based in school and a CAMHS worker who comes in every week, but we all need to be more aware and more proactive. That’s why I’ve recently appointed a Student Manager, whose job it is to work with staff as well as students to spot the signs that someone might be in distress. I don’t think you can separate good mental health from attainment. It’s all connected. There’s more to ensuring that pupils realise their potential than providing excellent teaching. They have to feel comfortable and happy too. In the past I’ve been so stressed that I’ve buckled in an exam and not done as well as I should – I know what it’s like. So when our pupils go in to an exam the teachers will line up outside and high five them on their way into the hall. It’s such a small thing – but it really boosts morale. It’s about saying, we’re here for you, we support you and we want you to do your best.